Entomology, macro photography of insects et al. The musings of a graphic designer/illustrator primarily about wildlife in Wiltshire. 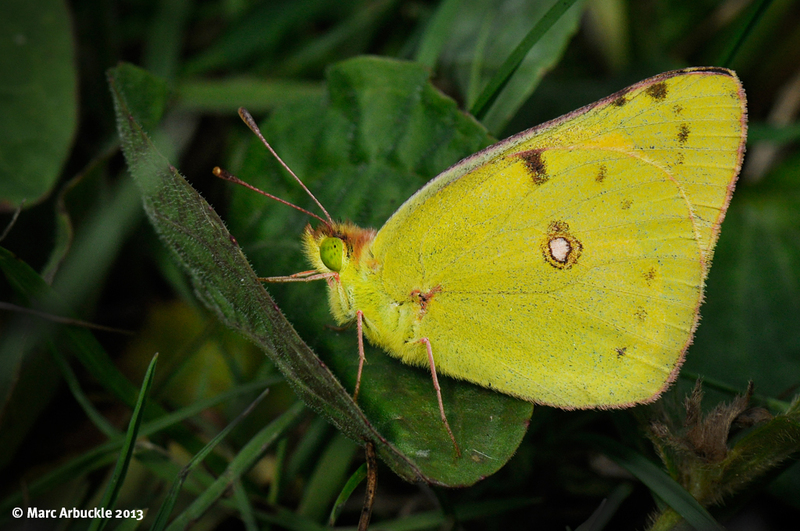 The Clouded Yellow Colias croceus isn’t a butterfly most of us get to see every year. It’s a summer migrant from southern Europe. If you live near the coast in Devon or Dorset and you’re the type of person that looks then you might get to see one or two each year. But further north you can go for years without seeing one at all. In nine out of ten years it is scarce. Then for reasons that we don’t fully understand we get an invasion. A glorious ‘Clouded Yellow year’ where numbers can be exceptional and individuals can be seen throughout the country and if we are truly blessed as far as southern Scotland. Sadly the year after, again for reasons we don’t fully understand, numbers can be extremely poor. So having spotted a dozen or so on Saturday afternoon at Martin Down NNR in Hampshire, I did the only sensible thing and went back again on Sunday morning. Well, that and the fact that my photos from Saturday were truly shocking. In my defence they’re tricky to photograph in as much as when they land they immediately fold their wings, plus they are all too easily spooked. As you can see the underside is attractive enough but you really need to get out there and see them flying to see the upperside which is rather stunning – something not lost on the Victorian collectors. Both upper wings are a warm sulphur yellow with black margins. The upper with a single black eye-spot, the lower with a double dark orange, yellow-edged eye-spot. For a change the female has the edge in colouration in that the black margin is sprinkled with bright yellow dots. These are absent in the male. The French have a good name for this butterfly ‘Le Souci’ (The Marigold) which is very descriptive of the upper wing colour. I saw plenty of Clouded Yellows in Cyprus earlier in the year so it was great to see them here in good old blighty. About this blog and the images. I'm a wildlife enthusiast with a particular interest in insects. As I take photos for identification purposes then inevitably I've developed an interest in macro photography. I'm entirely self-taught and most of my shots are hand-held. I know I'd get better images using flash and a tripod but I hate carrying things. As a result I take far more 'iffy' shots than good ones. For those of you interested, I'm currently using a Nikon D800 and a Micro-Nikkor 105mm f/2.8 Macro lens.